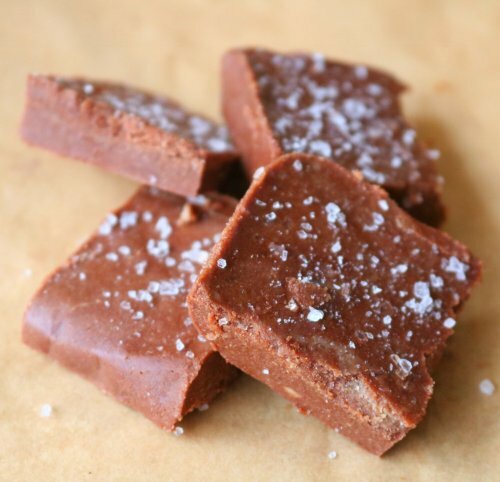 This raw salted tahini fudge is divine! So creamy, salty and packed full of wholesome goodness. It tastes so decadent and what’s more is so quick and easy to make and requires no baking. It’s filing too, so unlike traditional fudge which has your blood sugars spiking – this leaves you feeling healthfully satiated. The perfect go to healthy treat whenever a chocolate craving strikes. Line an 8×5 inch loaf tin with parchment paper. Add all of the ingredients except for the salt into a bowl and mix well. Taste and add more honey if needed. Pour the batter into the tin, and spread smoothly. Sprinkle with sea salt, then put the tin in the freezer for an hour or so or until solid. Remove the fudge from the tin and cut into squares. Store in freezer until ready to serve – they’ll melt quite quickly so keep in the freezer right until you’re ready to eat.